I am proud to announce that my Torque 3D Game Development Cookbook has recently been published. 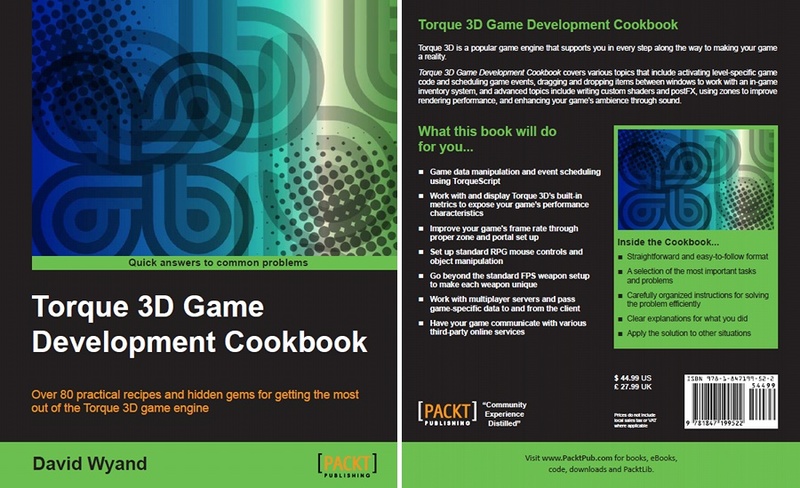 In the Spring of 2012, I was contacted by Packt Publishing to write a cookbook-style book on Torque 3D. For those that don’t know, a technical cookbook is very similar to a food cookbook. It is full of recipes of specific tasks or problem solutions, some short and some long. When I started writing the book, the MIT licensed version of Torque 3D was only a concept, and the retail version of T3D 1.2 was all that was available. Therefore, the book is based on using Torque 3D from a TorqueScript and built-in editor perspective. It really is amazing how much can be done in Torque 3D without needing to touch the source code. Since then Torque 3D has gone open source and we saw the release of v2.0 in December 2012. Through the magic of really fast book printing, I was able to make sure my book was updated for the 2.0 open source release, making this the most current Torque 3D book to date. Note: One recipe in Chapter 2 makes use of the FPS Example template that is currently only available in the retail release of Torque 3D 1.2. However, the concepts in that recipe will easily carry over to all other projects, which has to do with placing decals. For most of these recipes I’ve gone into great detail about the topic. For example, in Chapter 5: Your Graphics Evolved I provide a list of all available texture samplers and constants when making your own custom materials. This information is only currently available by going through the source code. The same is true for the postFX recipe, as postFX have a different set of available texture samplers and constants. Packt Publishing has a history of providing a sample chapter from each of their books. Chapter 6: Make That Sound Happen was chosen as the sample chapter you may all download and read right now. You can find it by clicking on the Sample Chapters tab on the Packt Publishing page for the book. This sample chapter is in black and white, while the eBook version of Torque 3D Game Development Cookbook has all images in color.